This is the film that introduced a new kind of monster to the world’s cinema screens. 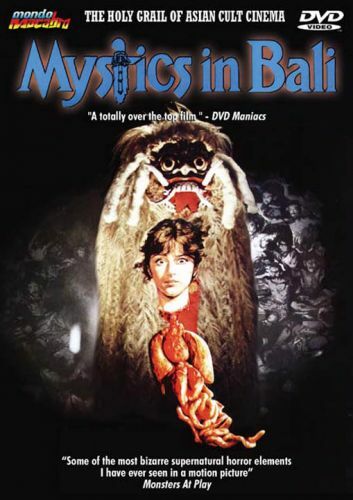 A sensation on its initial release in Asia, Mystics in Bali was deemed too bizarre and shocking to be screened in the west. Until now... This is the first time the film has been released in the US and is completely uncut and digitally remastered from the rare original negative. The film tells the story of a young American woman who goes to Asia in search of the secrets of ancient magic. One night in the forest, she encounters a female member of the terrifying cult of Leyak. She agrees to become the Leyak’s disciple and begins to indulge in many strange and savage rites. But the Leyak witch has secret plans for her young acolyte. Plans that culminate in one of the most bizarre and shocking scenes in all horror cinema. The holy grail of Asian cult cinema! Ilona Agathe Bastian, Yos Santo, Sofia WD, W. D. Mochtar, Debbie Cinthya Dewi, Itje Trisnawati, Ketut Suwita, Drs I Gusti Ngurah Lanang Jagat Karana, I Gusti Ngurah Oka Aryajimbaran, Drs I Gusti Lanang Agung Iswara, I Gusti Ngurah Putra Wiryanata, Atikah, Ida Ayn Trisnawati, Luh Putu Triyata, Nyoman Lokawatim, Nyoman Trisnawati, Emri Margono, Guru Mangku, Manku Anyar, I Gusti P. Sukardi, Tari Barong.